Sometimes it’s not about the belief so much as the believing. 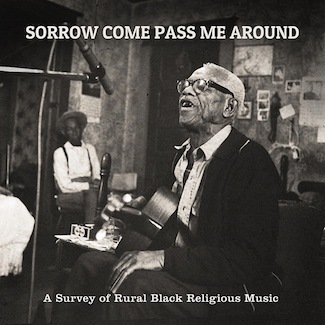 That’s the primary takeaway regarding Sorrow Come Pass Me Around: A Survey of Rural Black Religious Music. Originally issued in 1975 on Advent Records, this fine collection is bona fide classic. Long out of print, the assembled recordings are once again widely available via Dust-to-Digital who re-issued the album on vinyl in April. So here you’ll find blues singers like Furry Lewis, Robert “Nighthawk” Johnson, and Babe Strovall singing sacred music, though they are primarily known for their secular songs, on “the principal that the devil shouldn’t have all the best music,” right alongside Reverend Rubin Lacy, the mixed denominational trio of Annie Lee Crawford, Annie Mae Jones, and Oscar Crawford, and church soloist Katie Mae Young. The recordings are relaxed and often celebratory. “Blind Pete” Burrell’s rendition of “Do You Remember Me” floats on easygoing charm. Johnson’s “Can’t No Grave Hold My Body Down” is strident, a confidant boast in the power of the resurrection. Even the songs most concerned with matters of repentance — like “You Got to Give an Account” (“Of your sins,” the lyric continues) — sound like a party. Great post – I definitely agree with the “believing”, not “belief” part. It’s all about how you tick, not what makes you tick. The song is beautiful, too. Wonderful song, thank you for taking the time to post this. Burrell’s “a little talk with jesus makes it right” is one of my favorite renditions of that tune and included on this LP.